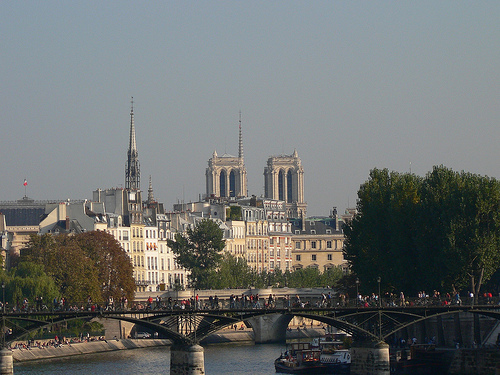 The Romans, after having conquered the Parisii tribe in 52 BC and taken up residence on the Ile de la Cité, extended their settlements little by little along the Left Bank of the Seine. They eventually reached what is now Mt. St-Geneviève, which got its name from the brave girl that banded the Parisians together during the barbarian raids. The Romans built a Forum, a theater and amphitheater, an aqueduct, thermal baths, as well as laying main roads through the area (such as the modern Rue St. Jacques). Traces of this ancient era still remain today; especially at the Cluny Museum, site of an old thermal bath. In the 12th century, the University of Paris took up residence in the old Notre-Dame cloister on the Left Bank; ever since, the whole neighborhood has been marked by its scholarly traditions. In 1253, Robert de Sorbon founded a school for the poor that over time gained international renown: The Sorbonne. The allure of the Sorbonne attracts huge numbers of students; it has been a powerful center of learning throughout its history. The Latin Quarter got its name because Latin was spoken here, and was in fact the official language until 1793. The university tradition lives on in this neighborhood, seat of the famous student protests of May 1968. Many rich monuments are also to be found in the area. The Pantheon, located on the top of Mt. St-Geneviève, looks out over all Paris. Tourists often love to stroll through this quaint, historic area; its many cafés, restaurants, theaters, and little bookshops make it a lively and attractive place to visit. AOL ~ Paris Night LIfe ( NightLife ), RMC ~ Hometown . Commercial WebSite: Paris Night Life ( NightLife ), RMC . Paris Night Life ( NightLife ), RMC BoBo Group.